Ages 4 through 8. 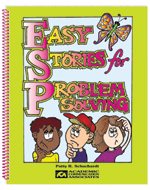 Each "easy story" in this book presents a situation in which a character must solve a problem. After listening to each short story, the child is asked questions about the story events. Questions such as "What should Danny do? and "What caused this problem?" are asked. Stories range in length from 35 to 150 words. Moreover, the stories consist primarily of short, simple sentences with commonly used verb forms. The short stories each include a line illustration, story comprehension questions, and questions that challenge children to verbalize solutions for various types of problems. The activities in this book can be used to facilitate the development of problem-solving skills that are critical for successful interactions in the classroom and in various types of social situations.